Johnny is the scion of a small farming family in Britain’s Pennine Mountains, a Northern region of England. When I say small farming family, I mean it: he is the only son of Deidre and Martin, two older folks who look as if rural existence has beaten the life out of them. Father Martin is in fact disabled, hobbled after a stroke. This leaves Johnny to look after the livestock, and the looking after of the livestock is portrayed in vivid detail. If you are made squeamish by Explicit Calving Action, and the aftermath thereof, this might not be a movie for you. Aside from carrying the weight of the farm on his shoulders—which he does poorly—Johnny has another issue. He’s gay, which one infers does not go down well either with his immediate family or the extremely lumpen residents of the tiny town where Johnny goes for his drink. Johnny’s world is shaken up a bit when Gheorghe, a Romanian immigrant with extensive experience and competence in tasks Johnny seems entirely indifferent to, arrives to temp at the farm. Gheorghe is handsome, confident, friendly. All of which annoys both Johnny and Martin no end at first. Once Gheorghe and Johnny get to work at an area of the farm far removed from the main house, their seeming hostility to each other gives way to something else. Once they’ve made love in the mud, they begin to bond. An unusual kind of Eden conjures itself up. The animals start to thrive (or at least do better) under Gheorghe’s tender, knowing ministrations, and Johnny himself opens up. He not only starts smiling more, he actually gets better-looking. “God’s Own Country” is a tricky movie, but not in a way that’s dishonest. Its first feet are in the school of miserablist realism, and while director Lee never abandons his things-as-they-are approach, he tells a love story by letting magic in at unusual angles. Most of which involve, yes, God’s own country, a ravishing landscape captured beautifully by the cinematography of Joshua James Williams. The land can be contended with, inhabited, but it can’t ever be tamed, is what the images tell us. So too it is with life itself. After Johnny’s father suffers another stroke, Johnny and Gheorghe have to face the question: do they have the conviction to try and make their situation, both personal and professional, permanent? Homophobia is not the only potential issue here. When Johnny take Gheorghe to his local pub, Gheorghe is disrespected by a xenophobic older townie. The “what will Mom think” issue is actually resolved in a way that’s surprising and moving, as is so much in the movie. 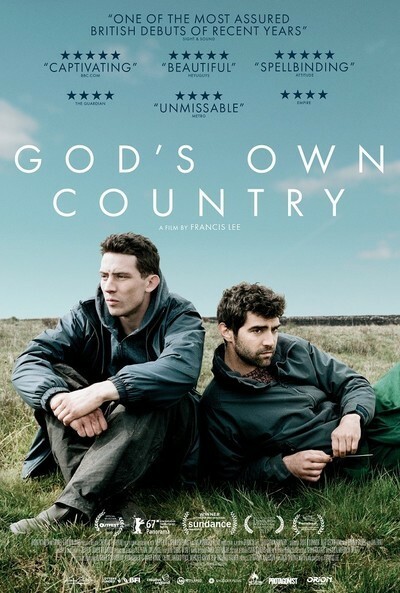 “God’s Own Country” asks a lot of its actors, physically and emotionally, and they come through. Josh O’Connor navigates Johnny’s soddenness and transformation with exceptional sensitivity. As Gheorghe, Alec Secareanu brings matinee-idol looks, easy charm, and palpable thoughtfulness to bear. Gemma Jones and Ian Hart play Johnny’s parents, and despite a two-decade age gap between the actors, they are perfectly matched and in a sense, unrecognizable; they could very well be rural folks discovered by the director. The movie’s denouement was ever so slightly sentimental for my tastes, but overall this is a pretty exceptional find; a solid story about how committing to what you believe in requires finding out what you believe in first. Sounds simple, but it’s not.